My seamstress had to take in my dress twice. I was delighted. The crazy thing was how easy it all was. I achieved my goals without caloric restriction, fasting, stimulants, or cleanses. No hunger, no cravings. I was eating high-quality, satisfying food, in greater volume than ever, and I was getting stronger and leaner. Like most American women born in 1981, I grew up in a culture that promoted cardio and calorie-counting at the same time it presented thinness as the aesthetic ideal. Accordingly, in my 20’s I began exercising 1-2 hours a day and became neurotic about food. Insofar as I kept my weight between an acceptable 140-150lbs for my 5’10” height, this strategy basically worked. But, for all my time and effort, I felt I should be leaner and fitter. In 2011, I switched from a lacto-ovo vegetarian diet to a strict vegan diet, partly for philosophical reasons, partly hoping the absence of dairy and eggs would improve my body composition. It didn’t. By the summer of 2012, I saw that I had lost muscle tone in my back and arms and added abdominal fat. This I considered a full-blown crisis because my wedding was four months away and I had banked on looking great for the event. Since caloric restriction and cardio were clearly not working, I got busy investigating fat-loss strategies and came across Jonathan Bailor’s SANE. 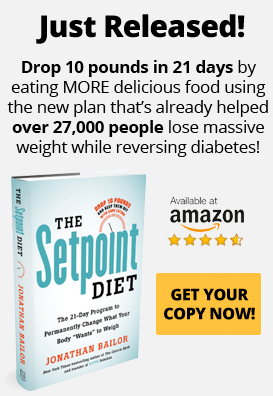 I read the book with great interest, listened to the podcasts, got involved in the web community, and, on the whole, transitioned into SANE eating fairly easily in August 2012. As a vegan, I was already off the Standard American Diet, and was already eating close to 10+ servings of non-starchy vegetables, but had relied on grains for protein! Imagine my dismay as I internalized the importance of lean, low-carb protein sources in the SSOS. Initially I replaced grains with tofu, seitan and plant proteins, despite misgivings about eating so much tofu and seitan, and despite not finding a plant protein powder that I wanted to eat every day. After a month, I capitulated to the convenience of egg whites and select dairy. Major body composition improvements followed more or less immediately: my arms and back began to tone up while my waist shrunk. With the exceptions of an inSANE vacation (try finding SANE vegetarian entrees on the road with a fiancé who doesn’t do Asian food) and weekend boozing (red wine and whiskey, though, no beer), I was approaching 100% SANE. By late December, I had regained the lost musculature in my upper body and had lost two inches around my waist. My seamstress had to take in my wedding dress twice. I was delighted. Having had a hard time wrapping my head around the “exercise less–smarter” notion, I decided to add eccentric exercises to my former exercise routine based on running, biking, Ashtanga yoga, and conventional strength training. This was tough, because, after my Saturday eccentric exercises, I was too sore for my long Sunday run, and too sore for my Monday yoga practice, and too sore for my Tuesday sprints, etc. I retooled my schedule so that I had a 2-3-day buffer between my eccentric day and other exercise days. So far, this works. In November, I set a personal record in a half marathon race, probably to the credit to SANE eating and HIIT sprint training. (1) Green smoothies are the silver bullet to getting multiple servings of raw non-starchy vegetables and lean protein. Experiment until you find one you love. I prefer mine cold and buy bulk organic, flash-frozen spinach and raspberries to achieve the milkshake effect. My current recipe uses about 2 cups frozen spinach, 3/4 cup of frozen raspberries, 2 scoops of vanilla whey protein powder, dollop of plain, nonfat Greek yogurt, quarter cup of flax meal, cinnamon and stevia to taste. I use cold water to blend. (2) Buy cartons of egg whites to make convenient and attractive oven frittatas. It takes less than five minutes to whisk together egg whites with two dollops of yogurt, salt, cayenne and a half-cup of nutritional yeast flakes (lean, flavorful, protein-rich alternative to cheese, and incredibly SANE as far as I can tell), and bake in a hot oven for 15-20 minutes. There are as many variations on this as there are non-starchy vegetables. (3) If you’re tempted to overeat a food that is SANE only in moderation, remove it from your house. I will eat nuts and avocados at restaurants, but I don’t stock them. (4) Green tea strategies. Consolidating ideas from the book and podcasts, I have an Amazon monthly subscription for bulk organic green tea (and flax meal, whey powder, stevia, etc.). Every PM I prepare ten bags of green tea for an overnight cold brew, and use the concentrate throughout the following day. (5) Booze strategies. Rather than eliminate alcohol, I aimed to drink less and smarter. I cut out beer, splurged on spectacular red wines, and used seltzer water and lemon juice to turn whiskey into something akin to a fizzy drink. (6) Do eccentric exercises highly caffeinated, with a great playlist, and in public. Having an audience improves your form, I find. The crazy thing was how easy it all was. I achieved my fitness goals without caloric restriction, fasting, stimulants, or cleanses. No hunger, no cravings. I was eating high-quality, satisfying food, in greater volume than ever, and I was getting stronger and leaner. It’s true I was exercising a lot, but still far less than I had before. This experience persuaded me that, for an individual seeking to achieve long-term health and fitness, eating SANE is the only way to go. I’m not sure whether I’ll try troubleshooting the vegan version of SANE eating, or whether I’ll continue lacto-ovo, but there’s no question that I’ll be eating SANE for the long term. I consider it tremendous good fortune that I came across SANE the summer before my wedding.